Convention season has begun for me at least. For other geeks and nerds it may have been sooner, or may come a bit later in the year. 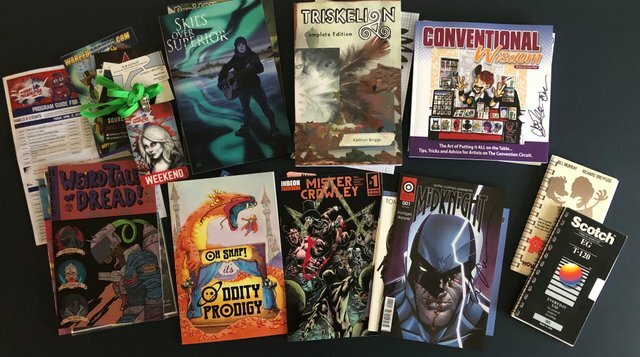 Nowadays in the United States, comic conventions can be found almost any weekend of the year, but they are still a bit more sparse in the winter months presumably due to the holidays, poor travel conditions and the like. Spring through fall though, you’ll find an abundance of fandom and pop culture at a multitude of venues. I’ve made it a point in recent years to at least try to attend 1 or 2 conventions a year. However for 2019 I plan on visiting as many conventions as time and finances will allow. As I work toward publishing the first issue of “I Thought It Would Be Zombies…” this fall, I’m already interested in scouting out venues to consider exhibiting at in 2020. This weekend the Great Philadelphia Comic Con was held. Fortunately I was off from work for the third and final day of the show on Sunday. Although it’s been running for about a half decade now, I hadn’t yet attended it personally so wasn’t quite sure what to expect. Exhausted from a rough week, I wasn’t hellbent on attending, but when I woke up this morning I figured I had just enough energy to give it a go. 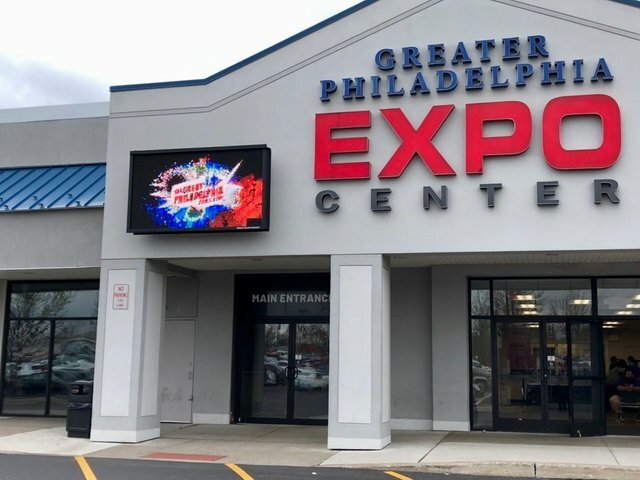 The venue is actually a bit outside of Philadelphia and is an easy 30 minute drive from my home. With that proximity I didn’t feel the need to force myself to stay all day and “make it worth my while.” I made it there by 11 AM, about an hour after doors opened, and spent the next 4 hours having a good time. It was a relaxing, enjoyable and motivating experience and I’m glad I went! Artist Alley is a staple of most cons, and it’s where I always spend the lions share of my time. I never go for celebrity autographs and I don’t do a ton of collectibles shopping (although the mood does strike sometimes). I do enjoy a good panel discussion or presentation, but mostly I like to see and support small independent creators like myself and chat with them. The show was decently attended but had a very large space to rival the larger conventions, and because of that didn’t feel at all crowded. It was well organized and pleasant overall. 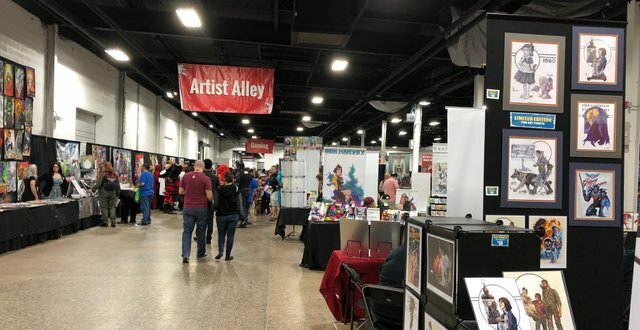 Artist Alley actually had prime placement at the front entrance, ensuring everyone at least walked through its main thoroughfares, if not up and down all the aisles, while on their way to sections for gaming, retailers, cosplay, and celebrity meet and greets. It’s a mid-size show so there weren’t the big names that are drawn to other conventions, but there was still plenty of items of interest to keep a person or family occupied and entertained for the day. I was pleasantly surprised with Artist Alley. At some conventions, the focus is very much on pop culture and big name super heroes, leading Artist Alley to be dominated by prints and professional level “fan art.” At times you can be hard pressed to find any actual indy comics to buy! This aspect of the comics industry was actually well represented at the Great Philadelphia Comic Con, especially given it’s a smaller show. In the relaxed atmosphere I had a great time chatting with a number of creators, and in most cases purchasing some of their work! This was probably the most talkative and outgoing I’ve ever been at a convention. I was picking every brain I could, asking them what conventions they enjoy attending and do well at, who they might be printing their work through, discussing their banners and convention displays… and of course their stories and art! All of this is in preparation for launching “I Thought It Would Be Zombies…” at the Baltimore Comic Con in October. I exchanged business cards, talked shop, and generally tried to get out of my shell a bit and start “networking” … a task that is not in my natural skillset. I came away with at least half a dozen great conversations with fellow creators and enthusiasts (and their corresponding work) to motivate and inform me. With any luck I’ll continue to see some of these folks at shows to come, and even reach out to some via social media or email to follow up and cement some newfound connections. And if you’re wondering… no, I didn’t try to lure any on to Steem… yet. But that’ll be a natural extension of any continued communication or collaboration with the convention circuit! If you’re a con-goer yourself, what are your favorite parts? And if you’re not, is there anything you’d like to ask to understand this strange and wonderful world? That’s what the comments section is for! See you there…. y’now… after my nap.